Apple appears to have inadvertently leaked images of the new MacBook Pro 48 hours before its official unveiling. The leaked images show a 13-inch MacBook Pro complete with the new “Magic Toolbar,” a Touch ID fingerprint scanner, and more besides. Apple is holding a press event on Thursday, October 27 titled Hello Again. The company is expected to unveil the new MacBook Pro Hello Again: Apple Will Reveal New Macs on October 27 Hello Again: Apple Will Reveal New Macs on October 27 Hello again. With these two simple words, Apple revealed what we've all been expecting for some time... new Macs are on their way. Read More (finally), as well as some other odds and sods. However, 48 hours before the event begins, two leaked images of the new MacBook Pro are doing the rounds. MacRumors claims to have found the images hiding within the recent macOS Sierra 10.12.1 update. 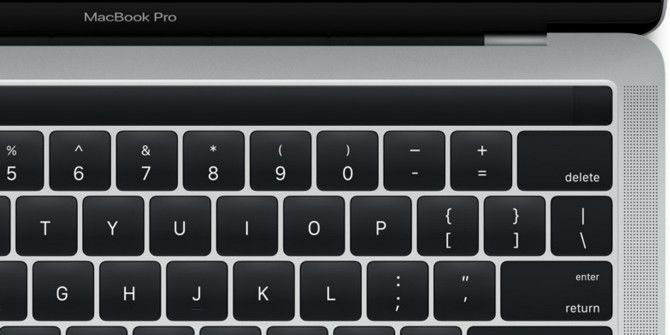 The images show the new MacBook Pro will sport the “Magic Toolbar” that’s been rumored for months. This is an OLED strip that sits where the function keys should be. With its functionality changing according to the app or setting being used at the time. To the right hand side of the “Magic Toolbar” is a Touch ID sensor, which is, in one of the images, being used with Apple Pay. The images also reveal an ultrathin keyboard similar to the one already offered on the 12-inch MacBook, the distinct lack of an Esc key, and speakers each side of the keyboard. From there on it’s all pure speculation. Will the new MacBook Pro be thinner and lighter, as is Apple’s wont? Will that leave less room for ports, except for USB Type-C ports What Is USB Type-C? What Is USB Type-C? Ah, the USB plug. It is as ubiquitous now as it is notorious for never being able to be plugged in right the first time. Read More ? Will the new MacBook Pro be a massive leap forward or just another incremental upgrade? We’ll know for sure on Thursday. Are These Photos Really Real? Really? We’re assuming these photos are real, and that Apple leaked them unintentionally. However, both of these assumptions could be wrong. Perhaps Apple meant for these to be splashed all over the internet to help build anticipation levels for Thursday’s Hello Again event. Or perhaps they’re not real at all, and designed to throw us all off the scent. We will, of course, find out the truth when Apple unveils the new MacBook Pro on October 27. The company may also reveal a new MacBook Air and an updated iMac. That is if we’ve all proved ourselves worthy over the past year (or four). Do you think this is the new MacBook Pro? Do you think Apple leaked these images intentionally or accidentally? Do you like what you see? What do you think of the “Magic Toolbar”? Please let us know your thoughts in the comments below!